Molly meets the stars of The Book Thief! Earlier this year, Into Film named The Book Thief as one of our most anticipated films of 2014, and the film did not let us down! 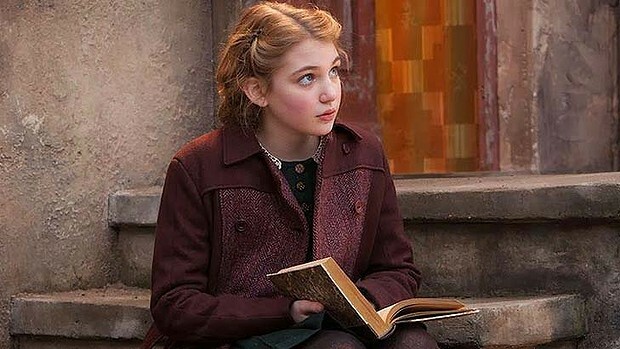 Based on the wonderful novel by Markus Zusak, The Book Thief tells the story of a young girl finding solace amidst the horrors of Germany during World War II by escaping into books. Into Film reporter Molly to meet with the film’s director Brian Percival and actress, Emily Watson about the making of the film and how creativity can overcome adversity. “Amongst a backdrop of war stricken Nazi Germany, propaganda and it’s consequent classes full of brainwashed children, young Liesel discovers a passion driven determination to read in a world where books are being burnt in public ceremonies out of hatred and fear. The title of this film betrays us as really it about far more than stealing books. Really it is about an intrigued young girl retrieving the knowledge, language and escapism from artistic oppression that fascist Germany imposed and that was endured by many like Liesel – the themes are universal and comprehensive for all to an extent. The fresh-faced performances of the young cast are compelling with the cinematography stunningly effective and redeeming the film from occasional bouts of blandness. At times the story can feel overly self-aware and blatant but the older performances from Geoffrey Rush, as Liesel’s affable new father, and Emily Watson as the stern, emotionally suppressed Mother figure drive forward an important tale and a thoroughly solid film. Sadly there was a missed opportunity to play with a fascinating idea; the idea that a film could be narrated by death, an inevitability which is sculpted into a smooth voice that guides us through tumbling clouds, a landscape of purity and transcendence, as we initially enter the film. If this had more emphasis, rather than just circulating the narrative, then perhaps the film would have that extra element it needs to become something quite special.